Tech Tracker is a semiweekly digest of links. I've scanned the broad scope of technology news and writing and summarized what I thought was the most interesting or important (or both). Miss class - buy the lecture. Should this college professor be selling his lectures online? Another "green" move: a carbon-free computer chip. When did using carbon become earth-unfriendly? Wow - dual quad-core processors in a Mac Pro means eight cores! That's a lot of power. Scam of the week: This "vodcast" was all a sham. No, she wasn't a 16 year-old homeschooler, but a 19 year-old actress fishing for a gig. Free downloads instead of pirated or paid-for - but the students don't want them. Surfing anonymously gave this guy more trouble than it was worth. I wonder how different Safari's "Private Browsing" feature is? 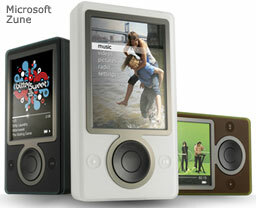 Zune revealed. So it looks like the key to "knocking the iPod off its throne" is the color brown. I ask you: What can brown do for you? The international push-back against Apple's digital rights management policies is itself scrutinized by U.S. antitrust officials.